A window opens. Simply copy and paste all of the numbers from the SLStreaming.com web page into the required fields. This shows a music only setup (MASTER radio button), Shoutcast selected, no change at default location of the encoder, 128 kbps, „Broadcast to a radio server,“ server IP address, port number, any name you want to give your stream such as your DJ name, your password (number of stars is equal to the number of characters in the password) and genre („Various“ if many). Click OK, and your encoder is set for streaming. Click „Start Recording.“ Connection confirmation appears. Play track. Here, the graphic shows we’ve ended play of a track on the left and started another on the right in a perfect VDJ style mix. This is what your Shoutcast server looks like in the browser while the stream is under way. Simply enter the parcel music URL into the browser address bar to reach this page. Another tab gives you your song history. To get to admin page, select the tab then enter user „admin“ and your password, same as encoder. Here you can see the log, do a kick in case a shared user failed to close connection (upstreaming connection) and other neat tricks. Hit the „Stop Recording“ button and it gives you statistics. Wear shopping bag and touch it. Web page address (keep confidential) appears in chat history, local chat and the blue menu, where you can go to the page in the in-game browser. Server URL, port and password appear. The config dialog on the broadcast tab is slightly different in VDJ 7.0.x Pro. Select MPEG (Shoutcast/Icecast2) and verify there is an encoder such as the LAME encoder in the file system. Start with 128kbps. Enter the server such as us.slstreaming.com, your port number (example 60050) and password. Click Start Recording and play song. It looks like this with the default skin. To hear your stream, set About Land -> media tab -> music URL to your parcel’s complete music URL (server and port), such as http://us.slstreaming.com:60050 and to verify by either listening in to the SL viewer or use a graphic visualization such as found in the view menu of foobar 2000 tuned to your parcel’s music URL. ☑ Enable winamp’s legacy mode, please. (2.) 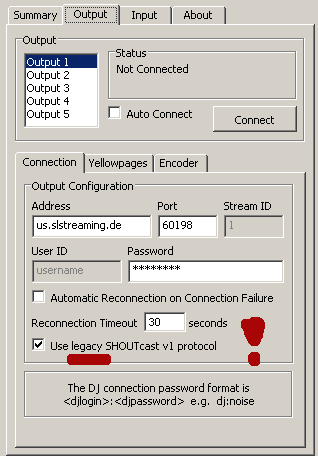 Setup your SHOUTcast server via CTRL-P -> Plugins -> Effects/DSP -> Config the plugin’s ‚connection‘-settings.